New Delhi, January ​11, 2017: Demonetization is changing the way India works and even holidays! Joining the bandwagon of cashless transactions are India’s travel portals. BigBreaks, one of India’s leading travel portals has come up with an innovative idea to beat the cash crunch, this marriage season. If a friend/relative is getting married and you don’t have cash to buy a wedding gift, fret not. 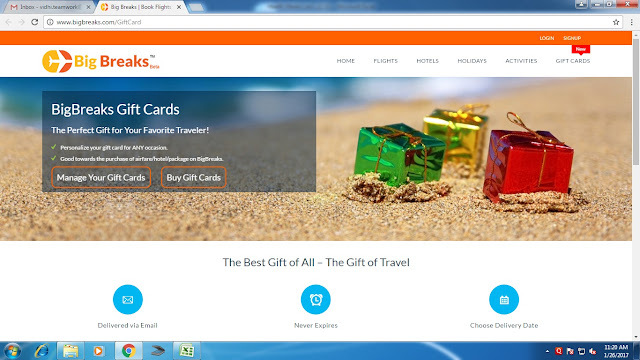 Apart from the various things you can buy and gift online, you can also gift a travel gift card. They come in various denominations, from Rs 1,100 to 21,000 to suit your pocket and your vhahwar (relationship) and are available on the travel portal’s website. “This gift card is an interesting idea in the world of online travel and highly relevant for ‘digital Indians living demonetization times. The new offering is a tiny step in the direction of a seamless transaction experience with value-added advantages.As an organization promoting best practices in the tourism domain, we are offering our customers the convenience of cashless travel gifting,” he adds. “Our gift cards are unique in a way because it promotes an excellent personalized experience as well as flexibility combined. You can gift the cards by logging in into our platform anytime and even choose the delivery date of your card,” says Goswamy. Launched in 2015, Bigbreaks.com is one of India’s most comprehensive and user-friendly travel portals, a kind of a travel super market for anyone wishing to travel within or from India. There are over a dozen online travel companies in India. BigBreaks’s USP is that it offers flexibility and customized service to popular and offbeat destinations at attractive prices and promises to personalize your tour to the last details.Costs, choice, and convenience are the three buzzwords for BigBreaks.